It feels more like October than May this week. Gale force Santa Ana winds and temperatures in the 90s have raised the red flag for fire danger and sent crowds to the beach, braving sand-blasting to seek relief from the heat, but before the winds blew in there was one perfect day for surfing. You could tell the surf was up without even seeing the ocean. 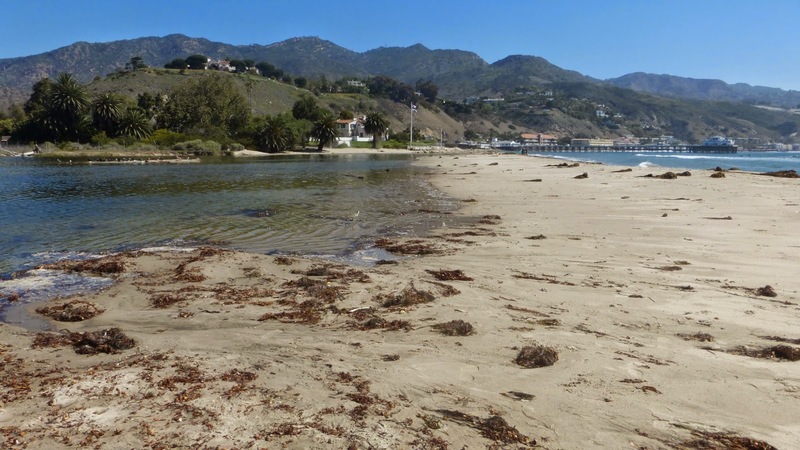 The Chumash name for Malibu—Humaliwu, "where the surf sounds," was well chosen. When there's a powerful swell the sound of the surf forms a dull roar in the background of the lives of anyone within a mile or so of any of the major local surf breaks. Another sure sign of surf is the mob of cars parked along PCH at Surfrider, Leo Carrillo, Nicholas Beach, as hopeful surfers skive off work or school in search of waves. They were double-parked at the Malibu Lagoon, but a car pulled out just in front of me and, on a whim, I stopped and joined the rag-tag army of wetsuit-clad surfers heading for the beach. "Not surfing today?" the guy behind me asked. "Just taking some pictures," I replied. 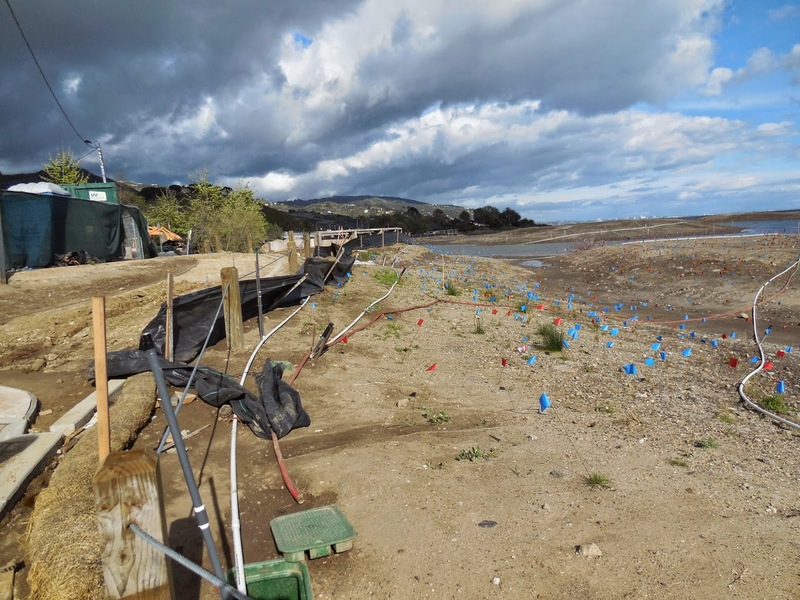 The vegetation at the controversial Malibu Lagoon restoration and reconstruction project is beginning to fill in, despite the drought, although there are still more flags than plants in some areas. The plastic flags are supposed to mark where the native plants are so they aren't weeded out by mistake. There was an American crow foraging for breakfast on one of new manmade islands. It's the first time I've spotted a bird there. Here's the same scene in 2013, during construction. I was amused to find there's a crow in this photo, too. Perched on the wire. The surfers took the quickest route to to the shore, but I stopped to admire the kayak of an audacious explorer, drawn aground near the parking lot. Later, I saw the kayaker paddling lazily around the lagoon. The sand berm is closed right now, transforming the newly re-contoured and enlarged wetland into a kind of brackish lake that is ideal for kayaking, even if it isn't an activity State Parks necessarily approves of. I also watched the crow carefully picking its way along the edge of the water, looking for breakfast. A few minutes later, I saw him again, harassing a black-crowned night heron at her nest on top of a ficus tree in a Malibu Colony garden adjacent to the park. Later, he was down on the beach, on the lookout for unattended picnics. This black-crowned night heron was defending her nest from the crow. The crow eventually gave up on eggs for breakfast and settled instead for whatever he could scavenge along the edge of the lagoon. I would never have spotted the heron if she wasn't giving the crow a piece of her mind. 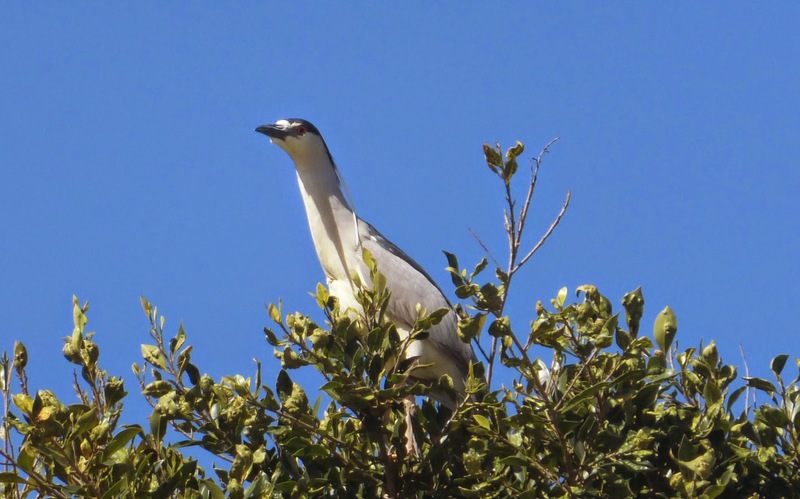 The genus name, Nycticorax, means "night croaker." It doesn't exactly do justice to their amazing range of vocalizations. I also stopped to examine the "Winter Ramp-Summer Clock" installation, which has already stopped being a ramp and become, well, not exactly a clock, but a water level gauge. 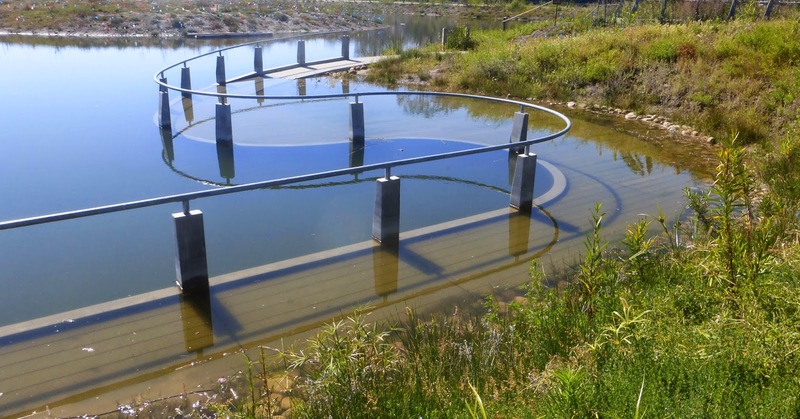 It's designed to fill with water once the sand berm seals off the lagoon in summer, transforming the walkway into a kind of post-apocalyptic scene that reminds me of Belgian symbolist painter Ferdinand Knopff's melancholy vision of the end of the world, "Verlorene Stad." 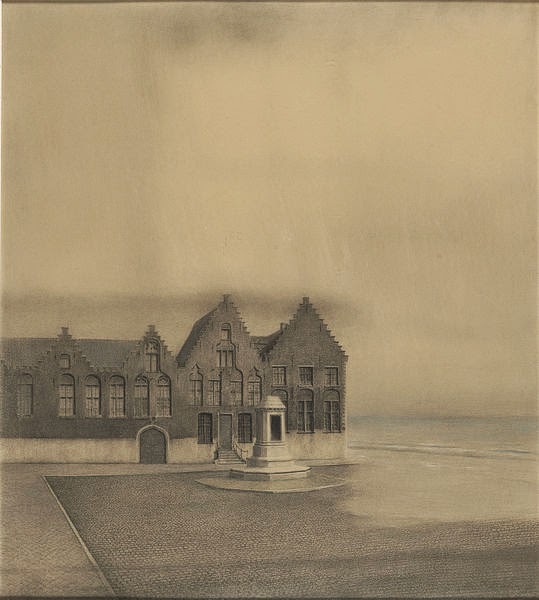 The last tide slowly and silently fills up a desolate Brussels street in Knopff's pastel drawing. I doubt that's what the Malibu Lagoon project's designers had in mind, but it does sort of convey the same impression, doesn't it? There was no silent end-of-the-world-evoking emptiness at the beach. Instead, an astonishing number of California Brown pelicans were gathered on the lagoon sand berm. I've described Surfrider Beach before as a kind of miniature Jurassic Park. Being on the beach with hundreds of pelicans is about as close as it gets to seeing live pterasaurs. Pelecanus occidentalis is on the smallish side compared to other members of the pelican family, but this bird is still a giant, with an 6-8-foot wing span. The distinctly prehistoric looking bill can grow to be more than a foot long and the throat pouch can reportedly hold up to two gallons of water. The pelicans, grave and silent, were joined by a huge, raucous flock of terns, their shrill voices rising above the sound of the surf. California brown pelicans are a rare conservation success story, rebounding from the edge of extinction in the 1970s. The terns' fate remains less certain. They are a California species of special concern due primarily to habitat loss. 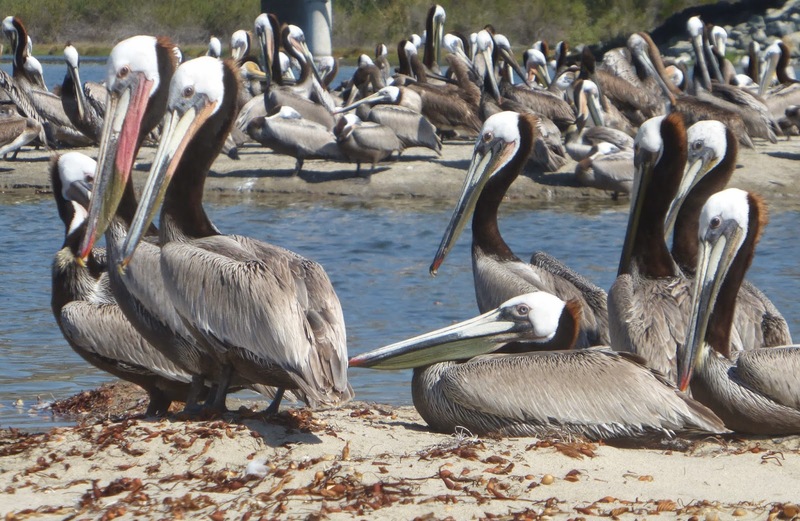 California brown pelicans crowd the sand spit at the Malibu Lagoon. 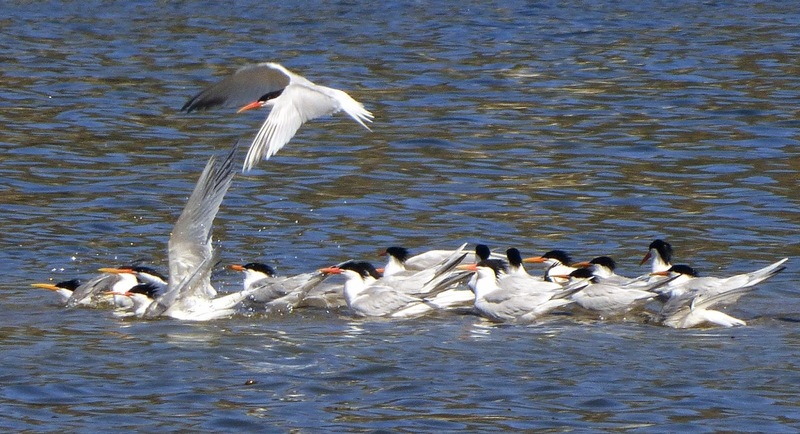 A huge group of elegant terns, the punk rockers of the tern family, were having a convention on the berm, too. Here's the Malibu Lagoon berm. It forms naturally every year after winter storm season ends and the sand deposited by the tides is no longer washed away by the creek. During the winter, the creek flows directly into the sea. During the summer months, the berm impounds the creek and turns it into a closed system. At the end of summer, it's either breached by the first storm of the season or by human intervention. The terns like to take advantage of the calm water inside the main channel of the creek. Usually they have to share with a flotilla of ducks, coots and cormorants, but they had it to themselves on this morning. The surfers are just on the other side of the berm, waiting for the waves that give Surfrider Beach its name. It gets crowded out there when the word goes out that the surf is good. But almost everyone—birds and humans—would agree that it's worth it. And every now and then, everything comes together and you catch that perfect wave. 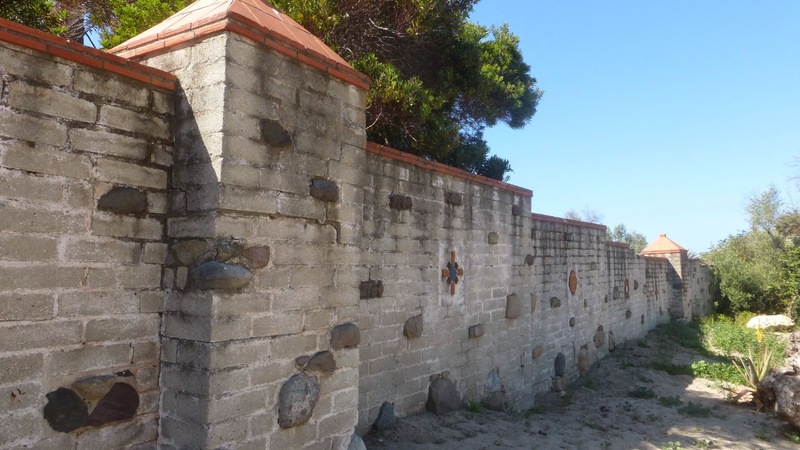 I walked back along the old Adamson House wall. When you see it in surf movies, it's always the side that faces the ocean, although a section of it is missing now, torn down after a truck smashed into it, and it's blotched with mismatched paint, where State Parks has painted over years of graffiti. This is the land side. It's in better shape and still decorated with bits of Malibu Potteries tile. 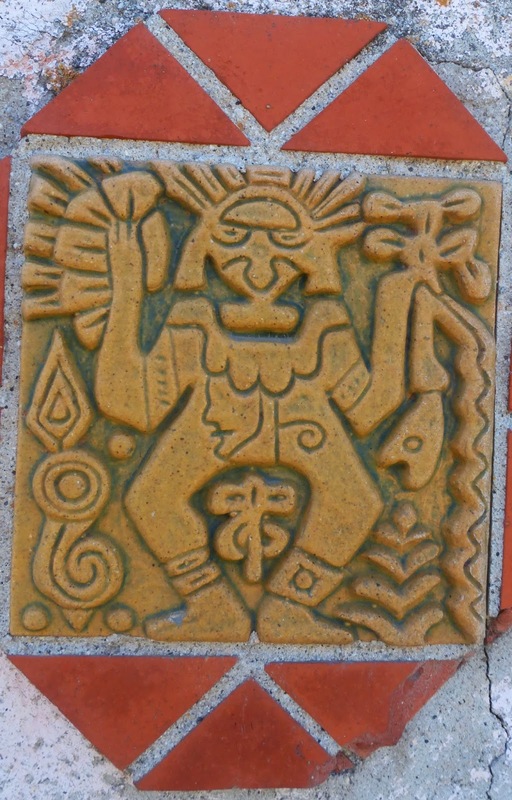 The Malibu Potteries' pseudo-Aztec god has kept a benign, if slightly lunatic, eye on the Surfrider surfers ever since the 1920s, when local legend says pioneer surfers Tom Blake, Sam Reid and Duke Kahanamoku first hit the waves at what is now Surfrider. More than anyone else I know, surfers understand the philosophy of living in the moment. Just hours after I took this photo the Santa Ana winds arrived, signaling the end of this surf event, but it didn't matter. "I was out there all morning and it was awesome," a surfer told me as I walked back to my car. It was, too. Carpe diem, dude.